In college there was a chocolate factory not too far from my campus. If the wind was just right, it would smell of fresh baked brownies, and send me running to the nearest chocolate. Our pesky little noses are often an obstacle for healthy eating, as many of our favorite, not as healthy foods, smell SOO delicious! I work with my clients on mindful eating strategies to overcome obstacles in their daily lives, such as smell. What is one way to overcome those enticing smells around you? I’m joining Nuts.Com and EatingBirdFood.Com in a contest celebrating National Trail Mix Day (August 31st). 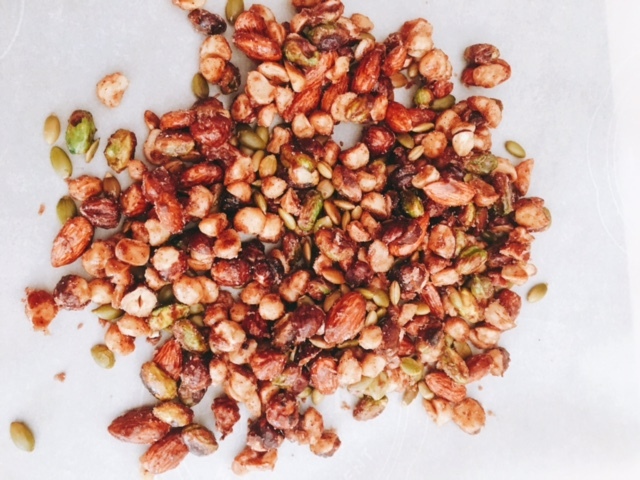 The smell from my Maple Sea Salt Trail Mix will finally trigger you to eat a healthier treat. This trail mix is loaded with protein, and slow digesting fiber that satisfies your gut AND your sweet tooth. The best part? It only takes 5 minutes to prepare, so you can toss it together minutes before guests arrive and have a snack and built in air freshner too! *You can use any nut combination as long as they total about 2 cups, but I highly recommend the macadamia nuts and hazelnuts. They lend a truly unique flavor. Pour maple syrup into a medium skillet and bring almost to a boil. Add in nuts, and pumpkin pie spice. Stir constantly until small crystals start to form. (2-3 minutes) As the name of this stage implies, you will see little tiny crystals start to form and the maple syrup will start to get stringy and form sticky bubbles. At this point, remove immediately from heat. 3. 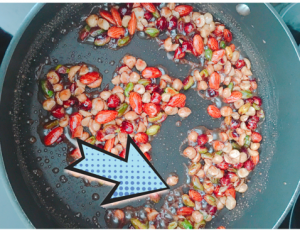 Spread out nuts on a baking sheet covered with parchment paper, and while still warm, sprinkle with sea salt. 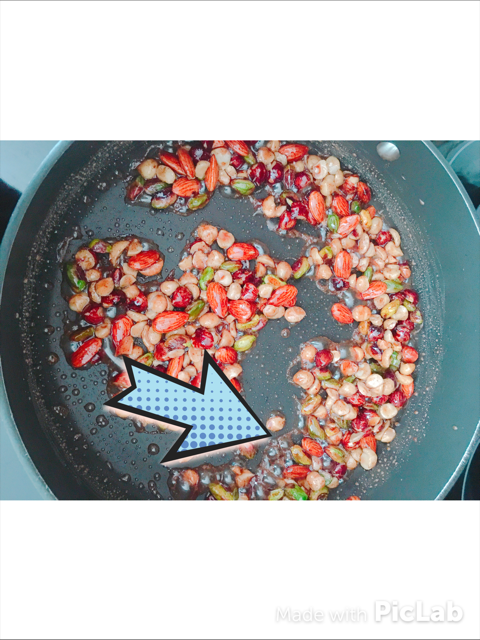 Gently press sea salt into nuts with the back of a spoon if necessary. Let nuts cool. 4. Serve or store in an airtight container. In a medium skillet place maple syrup and bring to almost a boil. Add in nuts, and pumpkin pie spice. Stir constantly until starts to crystalize (2-3 minutes) As the name implies you will see little tiny crystals start to form and the maple syrup will start to get stringy. At this point remove immediately from heat . Spread out nuts on a baking sheet covered with parchment paper, and while still warm, sprinkle with sea salt, press sea salt into nuts with the back of a spoon if necessary. Let nuts cool. Disclaimer: This recipe is for a contest hosted by nuts.com all thoughts are my own, and I was not compensated for my time.